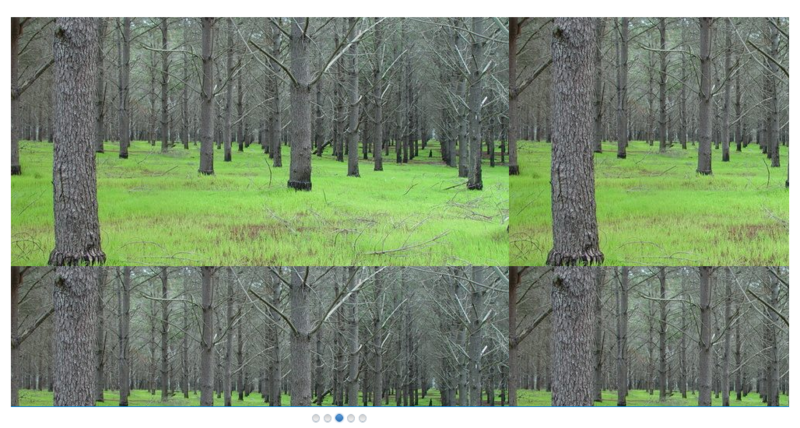 Meta Slider is a very popular, highly-rated plugin that allows you to create image sliders. 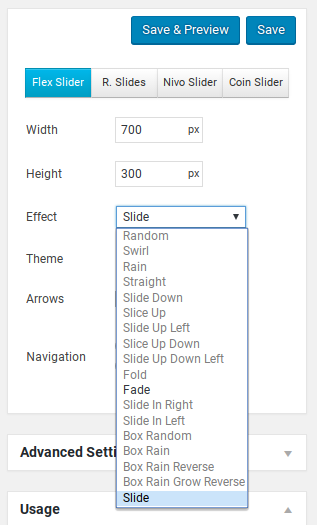 It has multiple different options for slider styles and transition effects for your slides. In our Meta Slider review, we’ll take a look at its main features and user interface to test how great (or not) it really is. 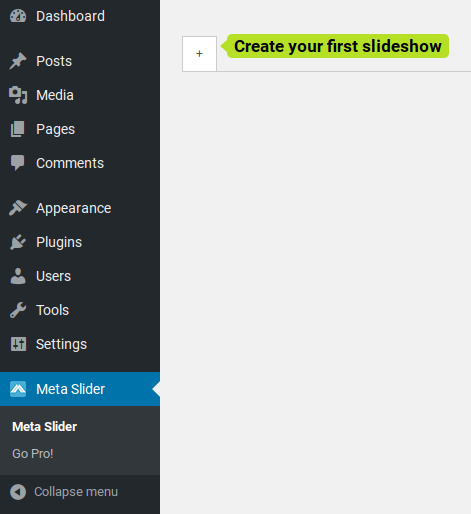 Meta Slider is a WordPress slider plugin with both free and premium versions. 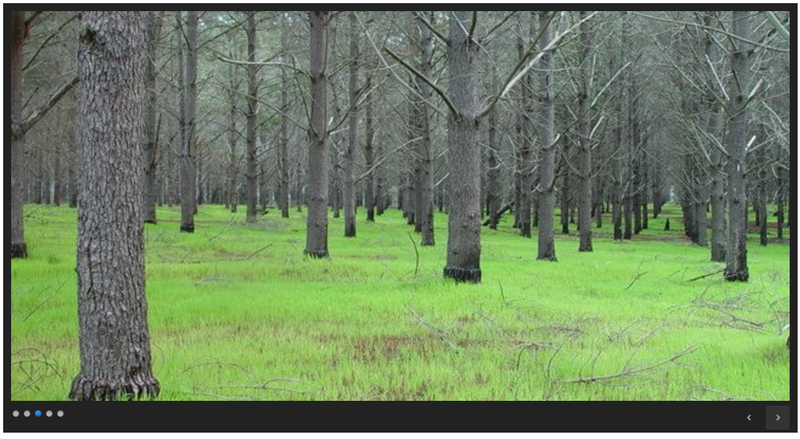 Using Meta Slider, you can create basic image sliders and use them on your WordPress site with shortcodes and template tags. Meta Slider was developed by Matcha Labs, a digital agency and product company based in the UK that specializes in WordPress and iOS development. After installing and activating the plugin, click on the new Meta Slider menu item on your WordPress dashboard. Then, click on the plus sign to get started. You can click on the tab to edit the name of your slider. Then, click the Add Slide button to add your first slide. This works like the default WordPress Add Media button in your posts and pages. You can choose an image from your media library, or upload a new one. 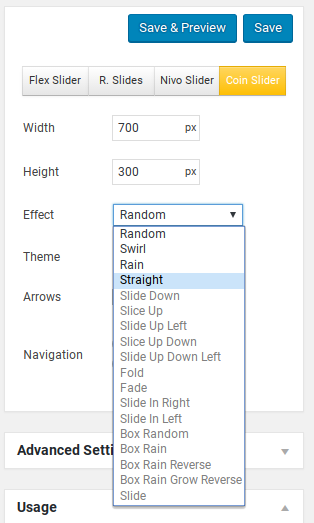 Then, click Add to slider. You can edit the description and add a link URL, if desired. 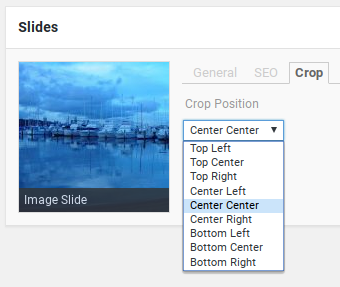 Under the Crop tab, you can select some options for cropping the slide. 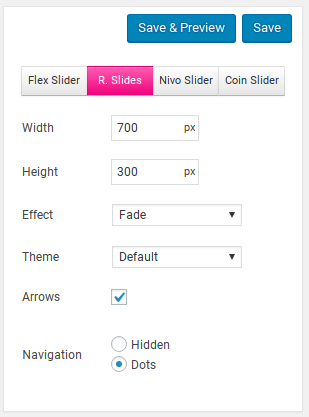 On the right side of the page, you can choose the type of slider you want to create. So, to find out what they look like, you’ll have to experiment and try each one. For the Flex Slider, only 2 transition effects are allowed to be selected. 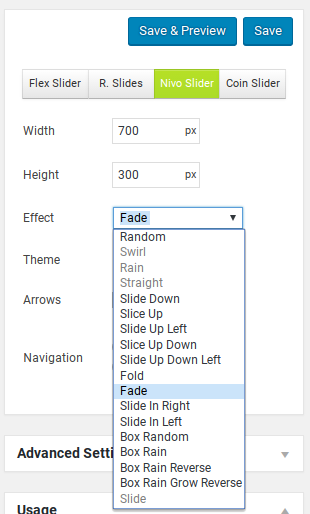 The Responsive Slider only allows the Fade transition effect. 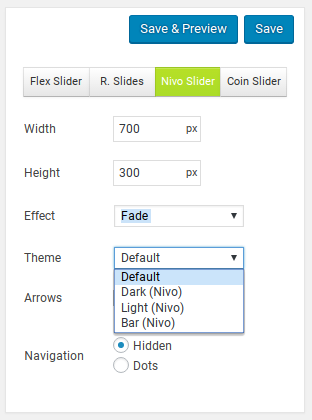 For the Nivo Slider, you can choose from more transition effects (but still not all of them). There are also 4 different themes to choose from. The Coin slider features just 4 transition effects. Unlike the other themes, the Coin slider has no arrows. You must navigate by clicking the buttons at the bottom, so be careful not to select the “Hidden” option for navigation. Under the Advanced Options area, you can customize your slider a bit more. Once you’ve finished creating your slider, click the Save button. 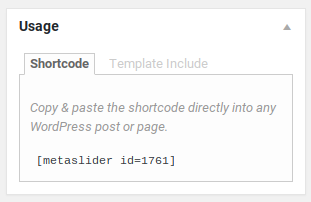 Under the Usage area on the right, you can copy the shortcode to display your slider, or click on Template Include to get the code to include it in your theme files. There’s a premium version of Meta Slider that unlocks more options. The documentation provides a very basic overview of what this plugin can do, but it doesn’t provide much detail. It would be more useful if they had more examples and screenshots, as well as explanations of the 4 slider types, so users aren’t left guessing. If you buy the Pro version, you’ll get access to priority support via a private ticket system. Users of the free theme can post in the forums at WordPress.org, but it looks like it can take a few weeks to get a response. Meta Slider is a premium plugin that gives you a choice to start with its free version. You can install the free version first, try out its features to get familiar, and purchase its premium version only if it has what you’re looking for. 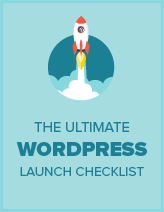 The free version is available at WordPress.org for download and use. For a small business or startup, the free version can be enough. But the sliders will look very basic and commonplace. If you want to create unique and impressive sliders, you should purchase Meta Slider Pro. The premium version is for advanced users who want to make their sliders stand out from the crowd with maximum customization options. 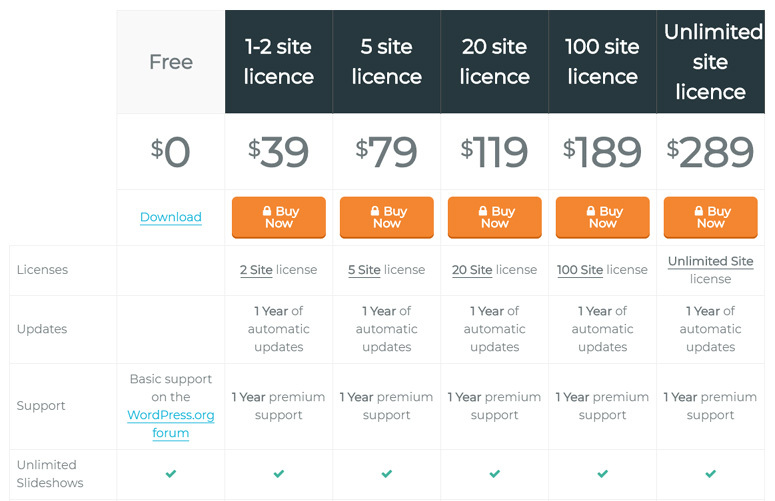 Meta Slider has 5 pricing plans for its premium version. You can choose a plan depending on the number of sites you want to use Meta Slider on. Meta Slider Pro for 1-2 site license costs $39, 5 site license costs $79, 20 site license costs $119, 100 site license costs $189, and unlimited site license costs $289. Meta Slider Pro gives you a plenty of options to choose from, so you can buy a plan precisely according to your need. All the premium plans come with 1 year of automatic updates and 1 year premium support. The free version users can get only basic forum support at WordPress.org. Meta Slider is a simple slider plugin that is easier to use than incredibly complex slider plugins like Slider Revolution or LayerSlider. However, the user interface isn’t as well-designed as it could be. Instead of matching the WordPress interface seamlessly, the system is a little jarring and takes some getting used to. It’s also unclear why there are 4 different types of sliders that’re so similar in design, with each very limited in features. Why can you only use the Fade effect on Responsive sliders? Why are the Coin sliders not responsive? It would make more sense to be able to select the styles and options you want individually, instead of having these 4 arbitrary names. The lack of information or previews for each slider type is frustrating as well, since you have to use trial and error to see what each one looks like. We would recommend using the Soliloquy slider plugin instead, since the interface seamlessly matches WordPress and it’s much easier to use. You can read more in our full Soliloquy review.